(Kitco News) - Gold prices are weaker in early trading action Monday as the market retreats from a key resistance zone around $1,220-$1,223 per ounce, basis June Comex futures. The gold market's inability to pierce the $1,223.70 high from March 2 last week is a near term bearish signal and leaves the metal vulnerable to additional weakness. 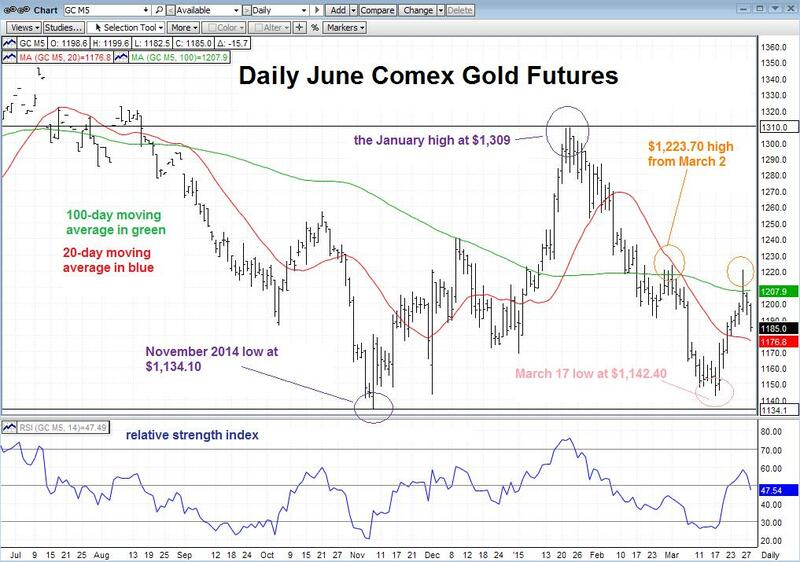 Overall, however, on a multi-month basis, gold prices continue to trade within a large neutral range. Last week's rally move in gold topped out at the $1,220.40 zone hit on March 26. See Figure 1 below. Gold approached, but could not match resistance at the March 2 high on that move. The bull's lack of momentum around that key resistance point is a short-term bearish signal and suggests the rally move off the March 17 low at $1,142.40 was corrective in nature to the larger sell-off from the January high. Also, last week's rally move saw gold stumble and fail to close back above the 100-day moving average, shown in green on Figure 1 below. The 100-day moving average is a trend following tool used by intermediate term traders and gold's hesitation at that zone is another weak technical signal for now. On the downside, gold is vulnerable to a test of 20-day moving average support at $1,176.80, shown in red on Figure 1. The 14-day relative strength index (RSI), a widely watched momentum tool has begun to weaken. Action around the 20-day moving average will be important to watch this week. If sustained declines are seen below that line it would add another bearish signal to the near term trend outlook for gold. Ultimately, declines under the 20-day moving average could leave gold vulnerable to a retest of the March low at $1,142.40. Taking a look at the multi-month trend outlook, since early November, gold has been trading in a large intermediate term neutral range. That range is marked out on Figure 1 with major resistance at the January high at $1,309 and major support at the November 2014 low at $1,134.10. Sustained declines under the 20-day moving average would leave the gold market vulnerable for a retreat toward the lower end of that large intermediate term range. The bears have the momentum right now.